Saket is a swank upmarket residential area, a short distance away from Mehrauli. 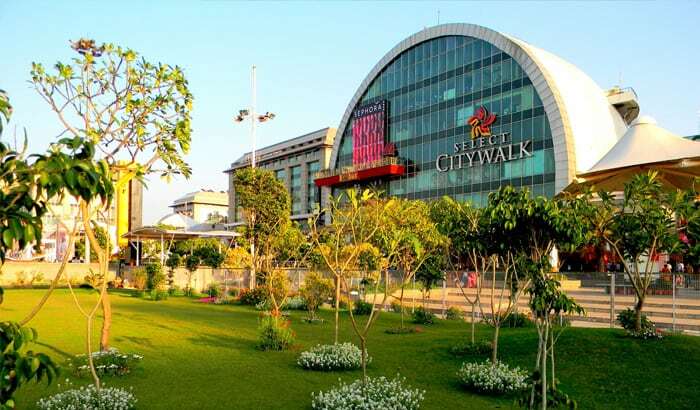 Filled with mall, making it a great shopping destination and restaurants serving delicious food and breathtaking views. Saket is a very popular place to hangout for both tourists and locals alike. Apart from glittering malls, there is another side of Saket which is slightly unexplored. The garden of five senses : Close to the Saket Metro Station, is a breathtaking and spectacular leisure space that is spread over 20 acres. Kiran Nadar Museum of Art (KNMA) : is a private art museum that brings visibility to modern and contemporary art in India. The Khiki Fort, a novel cross axial mosque is built more like a fortress with an unusual fusion of Islamic and traditional Hindu architecture. The latticed ‘Khirkis’ or windows on the upper floors give it the name- Mosque of Windows. Just across the Mosque is Satpula or the Seven Arched Bridge that is a remarkable ancient water harvesting dam constructed in the Tughlaq Dynasty.